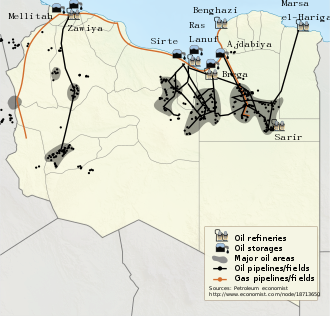 Since Field Marshal Khalifa Belqasim Haftar had captured the ports of Libya's state-run oil company, the National Oil Corporation, in Es Sider and Ra's Lanuf, oil production has risen from 220,000 barrels a day to about 600,000 barrels per day..
On 26 April 2018, after nearly three weeks of absence, Khalifa Haftar finally returned to Benghazi after his medical trip to Paris. In mid-April 2019, Henrietta Fore, Executive Director of UNICEF -the UN Children’s Fund - and Virginia Gamba , United Nations' Special Representative for Children and Armed Conflict, issued a joint statement to show their worries about children caught in the middle of fighting in Libya. 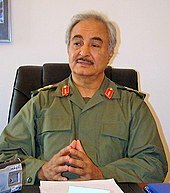 ^ "Air strikes and explosions hit Libyan capital | ePaper | DAWN.COM". epaper.dawn.com. Retrieved 22 April 2019. This page was last edited on 23 April 2019, at 17:34 (UTC).